IMAGE: The Hindenburg zeppelin, which caught fire as it tried to dock in New Jersey at the end of a 1937 cross-Atlantic voyage. 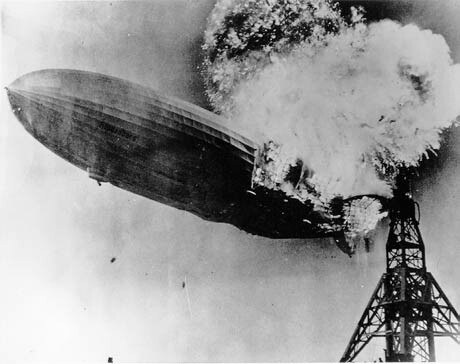 Last week, the New York Post reported that “a charred bottle of beer that survived the explosion of the Hindenburg will be auctioned off this month for an estimated $7,500.” The single bottle of Löwenbräu was recovered from the airship disaster by a New Jersey fireman. Much of its original content has evaporated, and the beer that remains is “probably quite putrid to taste,” according to Andrew Aldridge, of the auction house Henry Aldridge & Sons. This story reminded me of a rumour I heard a few years back: that drinkable vintage Champagne had been salvaged from the Titanic. 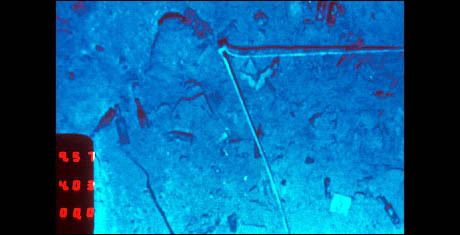 IMAGE: Wine bottles are visible among the debris of the Titanic on the sea floor in this photo taken by the 1985 joint Franco-American expedition that discovered the wreck’s location. Image courtesy of Woods Hole Oceanographic Institution. IMAGE: Cases of 1907 Heidieck & Co. 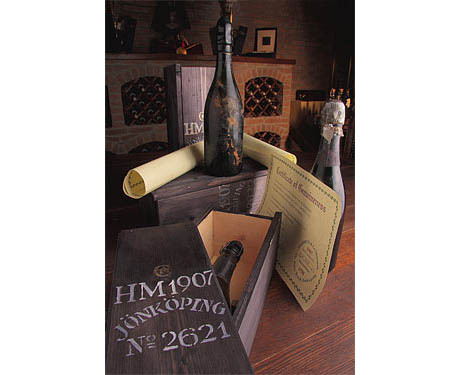 Monopole Champagne were retrieved in 1997 from the wreck of the Jönköping in the Gulf of Finland. Photo courtesy Vinocellar. 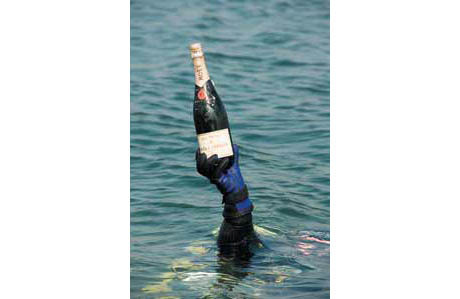 IMAGE: Diver bringing a champagne bottle to the surface, courtesy Dive Magazine. It appears the ocean floor, if treated as a single entity, might actually be the world’s largest wine cellar – a sunken treasure trove of lost vintages awaiting rediscovery. Like squirrels digging up acorns, wreck-divers and salvage companies stumble upon another forgotten cache every few years. 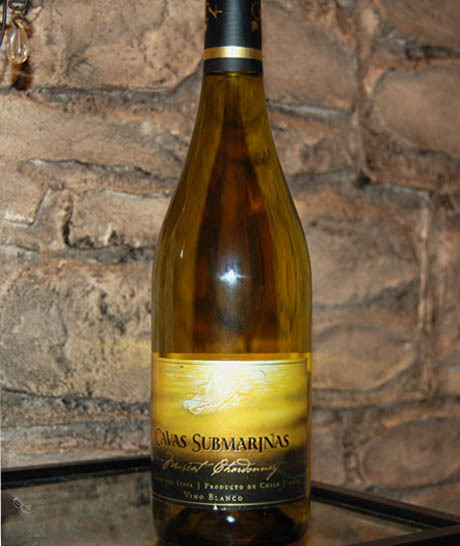 IMAGE: A Cavas Submarinas bottle. According to Luxist, they have special labels that don’t come off underwater. 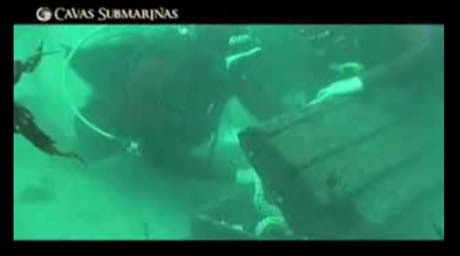 IMAGE: Screen grabs of divers retrieving wine bottles from underwater cellars from the insane Cavas Submarinas promotional video. Watch the full version, complete with mermaid, on YouTube. On the other hand, there was great oenological disappointment over the 1919 wreck of the RMS Republic, which was found in 1981. The Republic was a proto-Titanic – luxurious, owned by White Star Lines, and the largest operating cruise ship of her day, until she ran into another boat. Her salvors were actually looking for a secret cargo of American Gold Eagle coins, supposedly sent by the U.S. government “to pay for Czar Nicholas II’s Russian military buildup before the First World War.” Instead, they found a 1898 Moët & Chandon that still had “a robust, hearty taste with a pale color similar to ginger ale.” Unfortunately, after spending $10,000 per day to bring three hundred bottles to the surface, Wine Spectator reported that Christie’s “found no bottles in condition to be auctioned off.” They had all been “invaded by sulfur-producing bacteria that travel at the bottom of the sea,” according to Michael Davis, Vice President of Christie’s wine division. 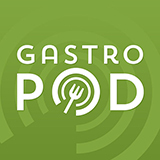 Meanwhile, for archaeologists, the alcoholic finds are a treasure trove of information, offering clues to cultural and socio-economic preferences, shipping and trade routes, and even shifts in climate and viniculture. For example, the Titanic and Republic wine cellars are typical of luxury cruise liners of the time, according to Wine Spectator. They contained relatively few Bordeaux, compared to wines that could be served chilled, such as Champagne and Mosel, because the rumble of the enormous steam engines would dislodge sediment in the older reds. 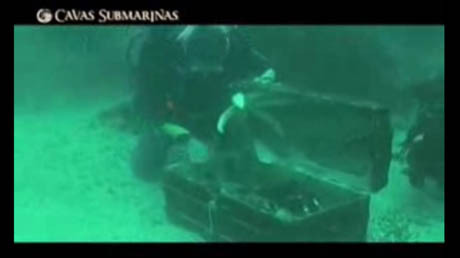 Sampling wines from shipwrecks also offers the chance to taste the pre-history of today’s wine-making styles. A 1996 paper published in the Australasian Historical Archaeology journal discusses the analysis of wines recovered from an 1841 shipwreck – the William Salthouse, in Melbourne’s Port Phillip Bay – in terms of the evolution of Muscat. 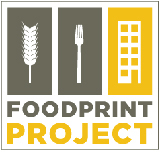 By combining chemical composition analysis with sensory data (i.e. sampling) and archival research, archaeologists with Heritage Victoria discovered that “Muscat was traditionally an unfortified style, quite different to today, due to a vinification technique called passerillage,” which created a wine with such high sugar levels that, to modern oenologists, it tastes like Sauternes. Finally, to return to the humble Löwenbräu with which this post began, I can’t help but feel that there is a certain rock & roll, self-destructive hedonism to drinking alcohol retrieved from disaster sites. Rather than dabbling in uninspiringly predictable mountains of coke, celebrities of a more poetic nature might prefer to drown their sorrows in the wine cellars of a doomed voyage. “1697 Establishment of distillery Adrianus van den Eelaart. 03/23/1929 Mr. L. Witkamp, one of the directors of SA Distillery Wed. A. v.d. Eelaart, dies at age 40. 11/09/1929 Mr. G. M. Witkamp. living in Scheveningen, director of SA Distillery Wed. A. van der Eelaart, dies at age of 34. 11/10/1930 The Schiedam firms Adr. of the Eelaert, A. Daalmeijer, S. Rijnbende and Zn., J.J. Meder and Son and Johs. de Kuyper & Son, present at the exhibition Horecaf in the Hague Zoo. 08/06/1948 The the commemoration of 200th anniversary Sun distillery. A. Eelaart . From the annals of the Brandewijn- en brandersgilde in Schiedam is in 1746 that the name of Van den Eelaart first appears, so the company is probably even older. It holds, however, the date of June 8, 1748 because on that day the company re-founded after a fierce fire. I wonder, did any of the wreckage survivors have land-locked twins? Does a Champagne that survives a wreck command a premium over one that merely aged gracefully in a cellar? Imagine a conspiracy of investors who torpedo ships, carefully marking the spot and returning decades later with salvage gear, and the hope of a high return. How exactly do ocean currents and sunlight reach bottles stored in underwater chests? While it would be nice to have a bottle of rare wine from the bottom of the ocean, from some exotic shipwreck, I’m not sure the investment would be a wise one, especially if it doesn’t make for good drinking! I will always remember as a young man seeing the Jacques Cousteau episode where they brought amphoras of Greek wine from a hundreds-of-years-ago shipwreck. Being good Frenchmen, they opened one and tried it. The verdict: Not great, but definitely drinkable. Or how about Krysstal (sp?) made from melted shards from ship-sinking icebergs. Also, the wines of the ocean moon of Europa.